Ask The Ripped Dude: How Do I Get Ripped Like A Ticket Stub? 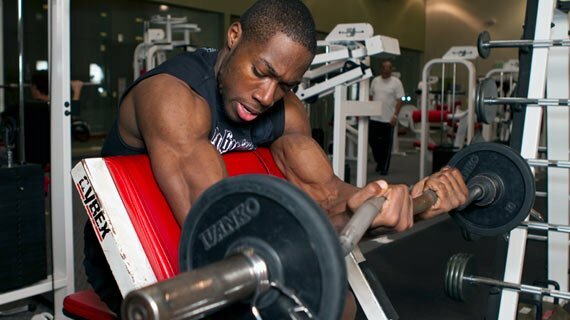 The World's Most Ripped Fitness Model, Obi Obadike, explains how to get really ripped naturally. I run 10k every other day and I do an hour of BodyPump on the opposite days. I eat well around 85% of the time. I am lean but NOT ripped. What can I do to get ripped, really RIPPED? Naturally? Obi: I've seen trouble like this before. I'm no detective, but this sounds like a case of Skinny-Fat-itis caused by excessive cardio and a lack of lifting! If you train religiously but don't have a ticket-stub body (ripped), you might need to pound the pavement less and move iron more. I know it's hard to hear, but there's no way you can maintain a lot of muscle running 10k every other day followed by an hour of BodyPump on opposite days. Even though BodyPump classes utilize weights, BodyPump includes a significant cardiovascular component. Cardio is important for fat loss, but eventually you have to be careful that you don't do too much. Listen: performing too much cardio can be counterproductive to your ripped goals! With excessive cardio every day, you'll start burning muscle as opposed to losing fat, and the end result will be that skinny-fat, long-distance-runner look. It doesn't sound like this is the ripped, lean physique you want. I've seen many people train this way. Most of them get that stringy look and end up with considerable amounts of fat on their bodies. First, cut your cardio in half and incorporate more weight-training in your weekly routine. You should be weight-training at least 3 to 4 times per week, which will allow you to build muscle and burn fat at the same time. Weight-training is one of the most important components in getting ripped. The extra muscle tissue you gain will burn fat. Why? Muscle tissue uses almost three times as many calories as fat, even while resting! If you add 2 to 5 pounds of muscle through weight-training, you can expect to burn up to 100 more calories per day. Muscle is the key to getting lean! The extra muscle tissue you gain will burn fat. Preach it! There are also different theories on when you should do cardio. For fat loss, should it be before you lift or after? The answer lies in a study conducted at the University of Tsukuba (Japan), published in Medicine & Science in Sports & Exercise. The study used ten 23-year old male students. The students had to cycle for 60 minutes at 50 percent of their V02 max. They cycled before they weight-trained and after they weight-trained on two separate days. The male subjects lost more fat doing cardio after they lifted instead of before! Researchers attributed the increased fat loss to heightened levels of adrenalin and noradrenalin after resistance training. You also have a higher growth hormone peak after you lift weights, which is another significant advantage to post-workout cardio. Growth hormone typically stimulates fat burning and muscle tissue recovery. Although weight-training and the right amount of cardio is important to overall fat loss, you still have to eat the right fat-burning foods. One of my favorite fat-burning foods that can also help you slowly build muscle is oatmeal. Oatmeal is a great fat-burner food, but watch out for heavy sugar in the single-serving packages. Another fat-burning favorite is chicken breast. Make sure when purchasing a chicken breast that it is lean with minimal fat. I also like egg whites, which are great for dieting and losing weight. Last is asparagus, a great fat-burning food. It has natural diuretic effects and contains a chemical called asparagine, an amino acid that directly affects the cells and breaks down fat. If you can incorporate all of these essentials - nutrition, resistance training and proper cardio timing - you can overcome Skinny-Fat-itis and turn yourself into a ticket stub: ripped, really ripped!